It’s easy to think of the earliest figures in the automotive industry as nothing more but characterless stern faces from black and white photographs. But that doesn’t square with Wilhelm Maybach taunting cops and getting into a police chase with one of the very first vehicles powered by a modern gas engine. Maybach was one of the four German inventors who all worked together in creating the modern gasoline engine as we know it: Maybach is credited with finishing up Nikolaus Otto’s invention of the four-stroke gasoline engine. Four-stroke is also called the Otto cycle, invented back in Germany while Maybach was at the Philadelphia World’s fair, representing the company at which they both worked. In any case, Maybach left that company (Deutz) with his other coworker and buddy Gottlieb Daimler to start on their own in 1882. (This company was Daimler, which went on to make the Mercedes, tie-up with Benz and become the three-pointed starmaker we know today.) Daimler and Maybach’s idea was to make these engines run at more practical higher speeds (racing up past 200 RPM!) and use them to power moving vehicles. 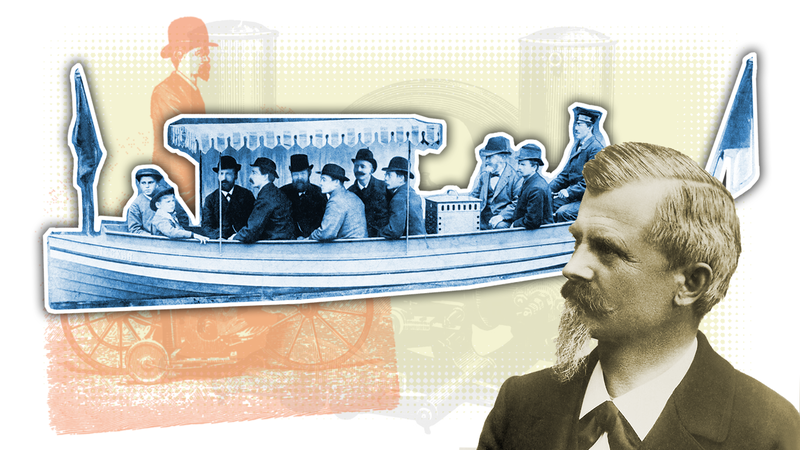 Daimler sought to push through technical innovation into the market: He motorized a normal rowing boat. On the occasion of the Frankfurt regatta, it should start in the spring of 1887 on the Main. When Wilhelm Maybach had come to Frankfurt on a light one-seater boat, he found that the local police vigorously objected to a demonstration on the grounds that all the relevant authorities had declared that the barge, full of petrol, was bound to explode, which would disturb the festival. Maybach, however, just before the opening of the regatta boarded the boat in an unguarded moment and chased down the race track before the police could intervene. The crowd cheered with enthusiasm over the daring run, but the eye of the law glared evilly. When Maybach completed his stint, he was arrested by the police as a “reckless driver” who broke the rules, even though everything had gone smoothly. I don’t know if it’s too strong to say that this incident inspired Bismarck to buy one such boat, and that this purchase secured favor for the motor vehicle in Germany and then the world. That seems like a bit of a stretch. But I do appreciate that it adds some character to the dusty old figure of Maybach and the early days when cars and other motor vehicles were at the very bleeding edge of tech and society.